Did you ever worry about riding in traffic, or got tired of replacing new battery for your bike tail light? 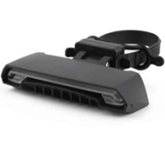 Get our Ampulla USB rechargeable bike tail light for you bicycle! Keep safe for your cycling. 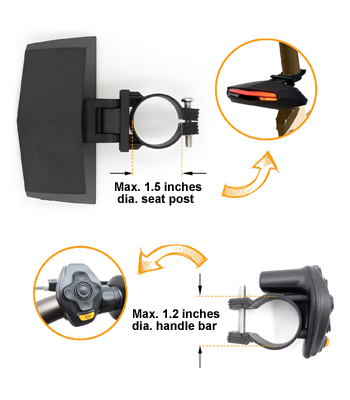 Now get you and your bike protected by installing AMAZING Ampulla bike tail light. 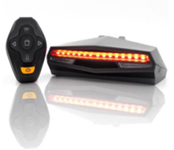 Ampulla bike tail light has 29 of 85LM LED lights (30lm is common used on other tail lights) & 2 ground lane alert, bright enough to be seen from 150ft away in foggy/rainy day or even in dark night. 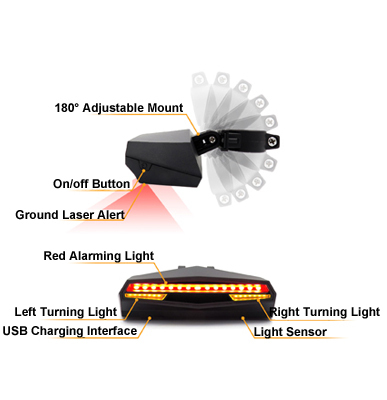 Remote control the bike tail light to send signals in different modes by the six easy to use buttons on the wireless controller. Simply turn on right/left turn signals through the wireless remote control, emergency lights, and ground lane alert. Get drivers' attentions from several blocks away, securing your safety when riding in traffic. Ultra-bright lane alert on the ground warns any possible incoming vehicle, giving the rider their own virtual lane, further increasing visibility. IPX4 Waterproof level can be used in small to moderate rain in the temperature of in -4-140°F -- your best partner for outdoor biking. 1. Do not disassemble the rear light by yourself. Inside the light there is dismantling fragile stickers, damge is not included in warranty. 2. Please charge this light if no use in six months, otherwise battery may not be fully charged or empty. 3. This product waterproof level is IPX4. Could be used in small to moderate rain, please don't soak the product into water. 4. Use the USB cable comes with the light to charge, don't use other cables to charge, otherwise it's easy to damage the device. Cons: Flashing mode isn't terribly bright. Lasers are very dim. Pros: - Clear Laser Channel: The channel can be casted on the underground into a trapezoid, from narrow to wide, which can attract attentions from the surrounding vehicles or passengers. - Nice Remote Control: The nice touching matte buttons are actually very easy to press, not like other remote bike. They are like mechanical keyboard, but soft and nice touch feeling. 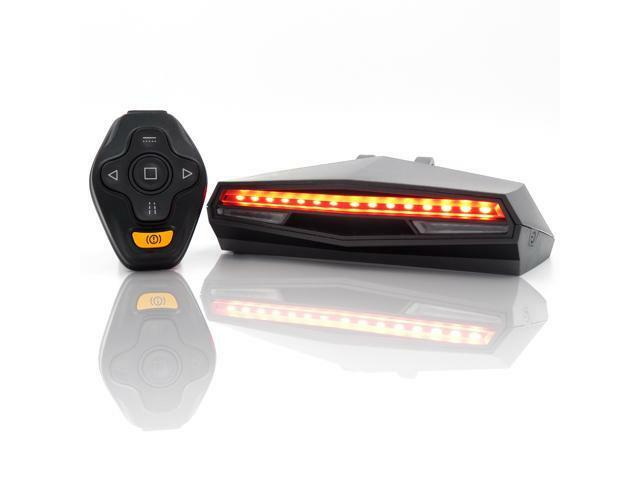 - Common Functions All Included: Ampulla C1 almost covers all the common functions of bike tail light in the market. This is really an all-at-once purchase. - Solid on Bike Frame: All the parts are fixed on the bike frame by screws. They are very solid which makes the bike light and remove impossible to be knocked out of the frame accidently. Cons: Screwdriver needed for installation: It requires screwdriver to install the bike tail light and remote. But it is not a big deal. Other Thoughts: It could be the most powerful & Hi-tech Bike Tail Light we can find. Worth a try. Pros: Super Bright LED lights can be seen from more than 200 yards. Turning Light is a great idea, we definitely them to avoid accident from some careless drivers. Easy installation, takes me 5 mins to install. Ground channel is very helpful, attracting other's attentions. Cons: Turning lights only stop blinking after 1 minute or pressing the button again, I will like if they go off after 30 secs. Screwdriver is needed for installation. Other Thoughts: This Bike Light is a super great product, and I am often asked by passerby ""where did you get this from, it looks cool~"". LOL"
- Featured with multiple functions, such as turn signals, laser virtual lane, emergency brake light, etc. Cons: - The brake light will keep blinking while it's charging. It could be very annoying if you charge it in your bedroom, you know what i mean. Other Thoughts: This is my 3rd tail light, before it I owned 2 cheap ones. None of them survived more than 3 months...sad...what's the point getting a cheap one and keep replaceing it every 3 months?? Glad i found this one on newegg. So far I seem to get what I paid for.